Making your own placemats is easy and it allows for all kinds of creative fun. You can create table linens to match any type of decor or special dishes, and you can even make a set of placemats to give as a housewarming gift or wedding present. No matter what level of sewing experience you have, there's a placemat pattern that will work for you. If you'd like to learn about machine quilting this is a great project to try, and the finished placemat is shown in the image above. You can get creative with the quilting pattern you choose, from straight lines to scallops and flourishes. This is also a great pattern for using those fun quilting prints. It's best if you have a little previous sewing experience, but you don't need to be an expert. Expect to spend about a half an hour on each placemat, more if you choose to do elaborate quilting. Begin by saving the pattern to your computer. Simply click on the image of the pattern to save the PDF, then enlarge and print as directed. Use the pattern to cut out the fabric and binding pieces you need for your placemats. Click to download the placemat patterns for both projects. Place one piece of quilting fabric face-down on your work surface. Stack the binding on top of it, lining up the edges. Then stack the other piece of quilting fabric face-up on top. Use safety pins to hold all three layers together as you work. Adjust your sewing machine stitch length to 3.5. 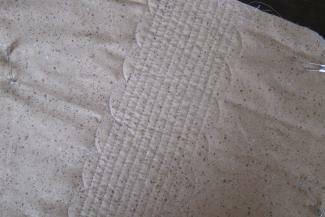 Using a walking foot, begin quilting your placemat. You can choose any design you like. If you're just starting out, try wavy or straight lines. Trim the outside edge of your placemat to make sure all the layers line up perfectly. 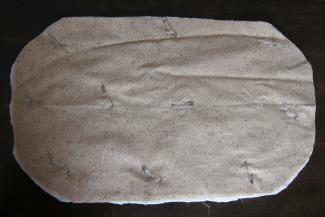 Iron the bias binding to remove any creases from packaging, and then pin it around the outside edge of the placemat. 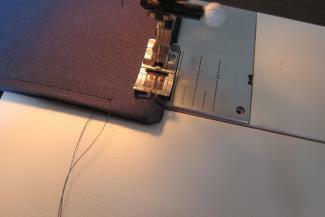 Using a stitch length of 3.5, carefully sew the binding in place. 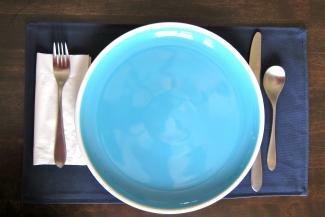 Repeat this process to create additional placemats. This design is so easy that a beginning seamstress can make it with no trouble. It also offers unlimited options for customization, since you can choose just about any heavy weight fabric you like. Cotton duck is a great choice if you want something that's easy to wash and still has enough body to support the shape. Choose two different fabrics if you want a reversible design. Each placemat will take you about 20 minutes. Click on the image of the pattern above to save the PDF file to your computer. Enlarge as directed and print. Use the pattern pieces to cut out the fabric for your placemat. Placing the right sides together, stack the two rectangles of fabric. 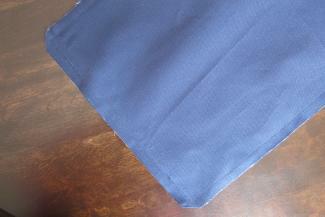 Pin along all four sides, and then sew around the edges using a 1/2 inch seam allowance. Leave a six-inch area open for turning. Turn the placemat right side out and press with the iron. Pin the open area closed. Adjust your sewing machine stitch length to 3.5 and top stitch around the placemat 1/4 inch from the edge, removing the pins when you're finished. AllFreeSewing has a pattern for washable placemats that are great for babies and toddlers. This is an easy project that's ideal for beginners. 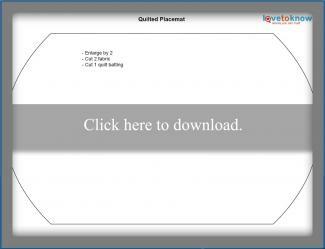 Kitchen Confections offers a free pattern for making a patchwork quilted placemat. This is best if you have a little previous quilting experience. Spoonflower Blog has a fantastic design for a quilted placemat with hexagons. Hexagons are a little tricky to piece, so this is best for those with advanced sewing skills. JinnyBeyer.com offers a free pattern for a placemat made with border print fabric. Best for those with previous experience, this design is unique and attractive. Making your own placemats is a great way to learn new sewing techniques and to set your table with style at the same time. Get creative with your fabric choices, quilting designs, and colors to create a beautiful set of table linens.